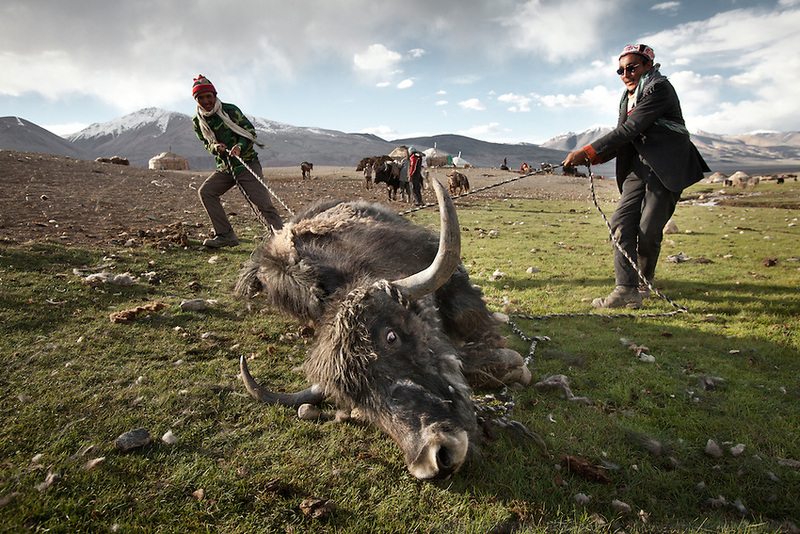 A yak, weighing about 700 Kg is caught before being sheared. It is impossible to overestimate the importance of livestock to the Kyrgyz. Not only do they provide for most of the Kyrgyz's subsistence needs and serve as the medium of trade that allows the Kyrgyz to procure all the other goods they require, but livestock are also one of the main determinants of social status. In the Afghan Pamir, livestock equals wealth and is more valuable than money..Summer camp of Muqur, Er Ali Boi's place...Trekking through the high altitude plateau of the Little Pamir mountains (average 4200 meters) , where the Afghan Kyrgyz community live all year, on the borders of China, Tajikistan and Pakistan.